SHONGA, Nigeria (Reuters) - When white Zimbabwean farmer Irvin Reid arrived in Nigeria almost five years ago, he was given a set of grid references in the remote bush and told to find water and build a new farm. His dairy farm now has 300 Jersey cows, some of among 800 imported from South Africa to start cattle farms in the region. It's a sharp contrast to things back in Zimbabwe, where campaigners say farmers face their worst year ever. Reid was one of 13 white farmers invited with their families to Nigeria in 2005 after land seizures in Zimbabwe -- which President Robert Mugabe says are necessary to correct the legacy of colonialism -- stripped them of their livelihoods. Africa's most populous nation of more than 140 million people, Nigeria imports about $3 billion worth of food annually and has been trying to boost its self-sufficiency. Farmers from South Korea, Kuwait and the United States have also arrived in Kwara state, some 400 km (250 miles) northwest of the commercial hub Lagos, which is keen to attract more investors and help Nigeria end its import reliance. Hoping Zimbabwe's loss might be its gain, Nigeria gave each farmer 1,000 hectares of land under a 25-year renewable lease in Shonga, the hub of the state's commercial agriculture project. Less than five years on, 80 percent of the land is under cultivation and the farmers have asked for more. "We arrived to virgin bush. We were basically just given GPS points, told to mark them out, clear the bush and find water, build the house, build the sheds, and import cattle," Reid said. "It was right from the grassroots and it was fun. We all lived in tents for a while," he said. Hundreds of tons of cassava, maize and soya beans are harvested for both local consumption and export markets. 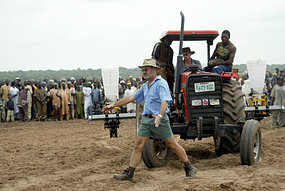 Graham Hatty, 70, is the chairman of the New Nigerian Farmers Associations, made up mostly of white Zimbabweans. He was once famous for the winter wheat crop he grew in Zimbabwe. "This is the Garden of Eden for us, everything grows here. It has been exciting coming here. I am doing what I love to do, which is to feed people, it is what I have done all my life," he said, a beaming smile emanating from under his straw hat. "It is quite ironic, I am here in Nigeria and I am told I am the biggest individual cassava grower in the country with 600 hectares of cassava in the ground," he said. White commercial farmers used to own 70 percent of Zimbabwe's fertile territory due to a colonial system that drove blacks from their ancestral lands. Ninety percent of the land is now in the hands of black farmers, but many lack commercial farming experience and are without adequate inputs. "This has not been a land reform program at all, this has been a political program," said John Worsley-Worswick of Justice for Agriculture, a Zimbabwean campaign group, speaking in Harare. "It has seen a decline in agriculture production down to levels of 15-20 percent of what was there before. "We are looking at the worst farming year ever this coming year ... there is less arable land that is being prepared, less inputs available ... Regardless of what sort of season we have, right from the onset it is destined to be a disaster," he said. In Nigeria, residents of Shonga were initially apprehensive when the Zimbabwe farmers first arrived. But that has changed. "We now have electricity, our health is improving because we have a new clinic and water, some of our sons and wives have found work on the farms," said 65-year-old Zubairu Abubakar, an elder of Chattaburo, one of 33 villages within the Shonga farms. Local government officials say the large-scale farming has increased local food supply, brought new skills to local farmers and triggered the emergence of new agricultural industries. Professor Mohammed Gana Yisa, Kwara state's commissioner of agriculture, said 15 new commercial farms had been developed in addition to the 13 at Shonga and that 3,000-4,000 people had found work in the Shonga farms alone. The state government has invested in a multi-million dollar cargo terminal which it says will be the continent's largest. "We are (focusing) on the Shonga farms...They are producing large, so we are positioning ourselves to be able to move these large quantities of farm produce to anywhere in the world," said Razak Atunwa, state commissioner for works and transport. Nigeria's agricultural sector has taken a back seat since the country started producing oil more than five decades ago. The Shonga farms are jointly financed by Nigerian banks, which have a 45 percent stake in the project while the Zimbabwean farmers and the Kwara state government hold 40 percent and 15 percent respectively. But, particularly with the global credit crunch forcing banks to tighten their lending criteria, access to long-term funds has been difficult. "The major challenge the farmers faced was the issue of credit facilities for agriculture," Professor Yisa said. "Our banks are not used to agriculture banking ... They want to give you money for agriculture today and then collect it back after 12 months," he said. Nigeria has set aside 200 billion naira to aid commercial farming in the country although the funds have not been forthcoming, slowing down work and potentially affecting next year's crop. But the problems have not deterred other investors from streaming into Kwara. Yisa said one group from Syria was clearing 600 hectares for poultry farming alone. David Higgins, a South African who used to work for dairy processing giant Parmalat in Johannesburg, recently joined the Shonga dairy farms and now manages Nigeria's only milk plant. "I saw an opportunity here ... and I can tell you now there is no doubt I am here for the long term," he said. "In spite of all the land we have leased out ... we have not gone beyond 20-25 percent of what is available for agriculture," Yisa said. "We have close to 2 million hectares of land and about 80 percent of this land is cultivable."